"What is it?" he heard near his left ear. Startled Starsky turned in the other direction. A broad grin appeared on his face. "There you are! Where have you been, pal?" "Here. Where else?" Hutch snorted emptying his last beer. Getting up from the stool his movements were a little insecure, too. Grabbing Starsky by the elbow Hutch said with conviction: "Let’s call it a day. C’mon!" "No, Hutch! First we have to try from that bottle over there. Let’s have a toast on our partnership. Finally we can work together – can’t wait to clean the streets from scum. We’ll be the greatest cops far and wide." "What about great cops? Can’t see any here!" Huggy joked coming out of the kitchen with two large burgers. He knew Starsky since the academy days and had heard a lot about Hutch, Starsky’s new found friend. Recently Starsky had introduced Hutch to the bar owner and it seemed that the three had the same wavelength. "Hug, haven’t heard what you just said about the cops. Give us a drink from that bottle over there – and thanks for the burgers. Just the right thing for the little hunger in between." "Starsky, we should head home. Tomorrow is our first working day at Metro." Hutch reminded his friend. Starsky looked at him blankly. "I just wanna have a toast on us. C’mon Huggy, fill the glasses and let me say, this is the beginning of a wonderful time. With friends like you," he beamed at Hutch and Huggy, "we can reach everything. Bay City will be the cleanest place on the west coast and…" Slowly Starsky slid from his bar stool, not even realizing it. "Yeah, buddy, what would they all do without you," Hutch supported his friend and shoved him gently but with determination toward the door. "Huggy, thanks for everything. See you later!" Hutch was already halfway out of the door when Huggy called after them. "Messieurs, hope you don’t intend to drive home by yourself in your condition. Otherwise I would have to call the cops." Huggy chuckled, took his car keys from a shelf behind the counter and moved toward the two men leaning against the door. "Special service of the house for special guests – I’ll drive you home." Huggy led his friends round the corner to his Chevy. He suspiciously looked at Starsky who appeared quite pale suddenly. "Hey, you aren’t gonna be sick, are you?" Starsky gulped audibly and shook his head. With Hutch’s help he slumped into the back seat, mumbling incoherent words. Soon they had reached Hutch’s apartment that he shared with Vanessa, his wife. "Thanks, Huggy," Hutch clasped hands with the lanky black man and got out of the car. "Hey, aren’t ya waiting for me?" Starsky mumbled half asleep. Hutch smiled, waved at Huggy and climbed the stairs up to his apartment. He was halfway there when the door opened and Vanessa appeared in the doorway. Looking disgusted at her husband she hissed: "Don’t tell me you’re drunk. You can leave right away! Didn’t I tell you to be home early because of the preparation for the party next weekend? We have to decide which…"
"Van, let’s discuss that later, I’m really tired now. Have to work tomorrow. You know, Starsky and I –"
"I can’t stand hearing that name over and over again! Was that guy with you again, misleading you to drink too much?" "What do you mean by that? I chose myself to drink because our request to be partnered was granted. Hey, you look beautiful," Hutch tried to mollify his wife but was shoved back. "As drunk as you are you can stay with your beloved p-a-r-t-n-e-r!" With these words Vanessa shut the door with a loud bang leaving Hutch outside. "Van! Let me in!" Hutch shouted. Then he realized that the neighborhood would be aware soon that they had a marital quarrel. Defeated he turned round with slumped shoulders. Where to go? he thought swaying lightly. Stepping down the stairs he heard the starting of a motor. Huggy! Not believing that the bar owner was still there Hutch approached the car and slipped in with a light groan. "Not the best time to get home, huh?" Huggy smiled pitifully. "How did you know?" Hutch asked. "Always knew that woman could be dangerous," came a slurred voice from behind. Starsky sat up with an effort. He leaned forward bracing his arms against the headrest of the front seat. "Hutch, you can bunk down at my place. If you don’t mind sleeping on my couch. If you want, you can take my bed. No problem." 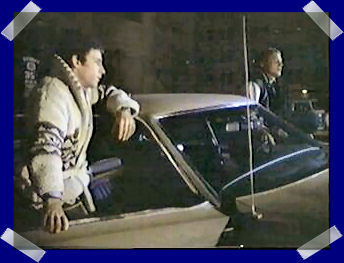 Starsky went on rambling, while Huggy drove to Starsky’s apartment in the hills. Sceptically he watched both men getting out of the car with a certain clumsiness. His offer of assistance was rejected, so Huggy headed off hoping his friends would get the rest they needed for their first day at Metro Division. Hutch was leading Starsky to the staircase when Starsky suddenly jerked and turned to the right. "’m gonna be sick, Hutch," and at the next moment he puked next to a bush. Hutch sighed and rubbed Starsky’s back soothing him. Fumbling for a handkerchief Hutch handed it to Starsky who wiped his mouth with trembling hands. "Feel already better now. - Look, Hutch. The bush over there looks as if he’s pointing at us making fun of me!" "Really?" Hutch saw the bush now and in the light of a street lamp it really looked as if it gave them the finger. They looked at each other and burst out laughing. "C’mon, let’s get you up the stairs, we have to get some rest," Hutch reminded his friend of the next day. Giggling Starsky let Hutch shove him upstairs. "The key," he mumbled looking frantically for it in his pockets. "Can’t find it. Must have lost it." "No! Don’t tell me!" Hutch said getting a little impatient. "Hutch, would you go down again and look for it under the street light?" "Why there? We haven’t been there at all," Hutch said questioningly. "Well, there’s much brighter." Starsky stated in earnest. Hutch lost his composure. Laughing hysterically he sat down in front of the door, joined by a giggling Starsky. Suddenly a window of the next house opened and the furious voice of a woman was heard. "Stop it, whoever’s disturbing my sleep! Stop it or I call the cops!" That caused only a bigger laughter till both of them had the same idea and put a hand on the other’s mouth. Coming to his senses Hutch sighed. "Starsky, you must have a spare key somewhere." "Indeed," Starsky answered. "Mrs Smithers next door has one. But we shouldn’t ask her right now. The lady seems to be in a bad mood, as far as I could hear." Hutch understood. He had no desire to meet another furious woman that night. He only wanted to sleep. Feeling Starsky’s dead weight against his shoulder Hutch knew that Starsky was half asleep. "No way, buddy. C’mon, get up," Hutch snorted. Starsky shifted and made himself more comfortable. "I have to look for the key," Hutch mumbled, looking downstairs where they had come from. Untangling from Starsky he decided to check Starsky’s jeans pockets first. What was that? In the back pocket there was the key! Starsky stirred and giggled. "Stop it, I’m ticklish there." He opened his eyes and looked into the angry eyes of his partner. "Oh, Starsk, what did you tell me about your lost keys. They were here in your pocket. Now get up and open the door." Starsky, still looking confused, got up and unlocked the door. As soon as they were inside he hurried into the bathroom while Hutch fetched a pillow and a blanket for the couch. Shedding his shoes Hutch lay down on the couch, turned onto his side and was half asleep when he felt Starsky’s hand caressing his hair in a brief gesture. Hutch smiled and fell asleep. Bright sunlight flooded the room when Hutch awoke with a sore back and a growing headache. They had tied one on at Huggy’s and today it was Sunday. He stretched his long body when the sudden realization hit him that it was Monday and they had to start their first day at Metro as partners. And they had celebrated this event, had come home late…What time was it? "Starsk?" Hutch croaked and when he got no answer he got up and peeked into Starsky’s bedroom. His partner lay fully-clothed on his bed not moving at all. The alarm clock said half past seven. At eight o’clock they had to be at the precinct! "Get up! We’re late!" Hutch almost shouted. He grabbed Starsky’s shoulders to turn him around. Feeling attacked, Starsky struck out and almost hit Hutch in the jaw. "Shh, it’s only me!" Hutch calmed his friend. Slowly Starsky was awake. He stumbled off the bed and was pushed gently to the bathroom. "We have to share the bathroom. You wanna shower first?" Hutch asked. Starsky nodded, stripped and disappeared behind the curtain while Hutch took care of business and shaved. After twenty minutes they were ready to face their first day at the precinct. Leaving Starsky’s apartment they looked at each other and smiled remembering the last night with strange looking bushes and a key that wasn’t lost at all. "You’ll see, it’s gonna be a wonderful day," Starsky started. Then he stopped walking. "Where’s my car?" "Oops, Huggy was so kind to drive us home. That means," Hutch said helplessly, "your car is still at the Pits." Hutch checked the time and got desperate. "We’re late on our first day. That’s inexcusable!" "Mornin’, Mrs Smithers, how are you?" Starsky greeted the old lady who was coming out of the next door. "Good morning, Mr Starsky. You need a lift? I see your car must be at the garage again. As I say, these old cars… Come on, I’m driving into town, it’s no great deal to take you there." "Thank you, Mrs Smithers," Starsky choked out. Both men kept silent on their way to the precinct. They only nodded when Mrs Smithers complained about too much noise at night in the neighborhood. Starsky and Hutch promised to keep an eye on these perpetrators. Finally they entered Metro and hurried to their squadroom. They introduced themselves to the other three officers and were soon chatting about their jobs. They were told where the coffee machine was and that they were supposed to sit opposite to each other. Starsky told them about their previous celebration and the short night and they all had a good laugh. A loud hollering voice was heard in the hall and Starsky joked, "Is that a suspect complaining about his arrest?" The squadroom door swung open and a commanding black man burst into the room. His dark face was even darker because of the anger and his suit tightened over his ample belly when he put his hands to his hips and roared: "Where are Starsky and Hutchinson?" When he didn’t get an answer immediately he looked at Hutch and hollered: "Mr Starsky, I presume!" "No, he-he’s Starsky," Hutch pointed at his friend. "I’m Hutch –Hutchinson." Hutch blushed deeply. "Can’t he introduce himself?" The big man went on hollering. Starsky had paled. "Into my office!" Totally unsettled they followed the man, exchanging glances when they noticed the sign on the door: Captain H. Dobey. Starsky slumped on a chair in front of the desk. "Did I tell you to sit down?" yelled Captain Dobey and Starsky shot up from the chair. He felt Hutch’s reassuring hand on his back. Both men stood in front their superior, rooted to the spot. "Can the gentlemen explain why they’re late?" Dobey’s voice had calmed down somewhat. He noticed that the tall blond had put his hand on the dark haired man’s shoulder. They reminded him of his own partnership with his friend Elmo Jackson a long time ago. He didn’t feel so bad about these two men, but first he had to teach them a lesson. "I’m listening!" he snarled. The two young men locked glances and said in unison: "It’s because we celebrated our partnership yesterday," and Hutch went on, "So it got a little late…" His voice trailed off and Dobey hid a smile. "That doesn’t excuse anything. The next two weeks I dispose you to nightshift. A warehouse has to be observed. Officer Snider will give you the details. And now get out of my office." He dismissed them with a waving gesture. When they were half out of the door, he shouted, "Hutchinson!" "Yes, Sir?" Hutch waited patiently. "Tell your partner he needs a haircut!" The door closed behind the young detectives and Dobey leaned back in his chair. He had the feeling that these two men would become somewhat special to him, but he couldn’t explain why. Shaking his head he went back to his work. "You still alive?" The other officers asked pitifully. Starsky exhaled a long breath. Perching on a corner of the desk he said slowly, "I always thought it would be dangerous working on the streets. Now I know where the real danger can be!"